The all-inclusive rates at the Tyler Place Family Resort in northwest Vermont cover accommodations, three meals a day, the truly exceptional children's program and a slew of adult and family activities on land and water. Last but definitely not least, every guest of every age gets a free loaner bike to ride for the entire week—also included in the rate. Drop by the bike shed on arrival day, and you'll find one-speed bikes with baby seats, trail-a-bikes, tandems, and bikes with training wheels and retro banana seats. Whether your kid is into Barbie or BMX, whether you fancy a classic cruiser or road bike, there are wheels with your name on it. The borrowing process couldn't be easier; just pick a bike you like (no sign-outs! no contract!) and return it on departure day on the honor system. You pay nothing extra. 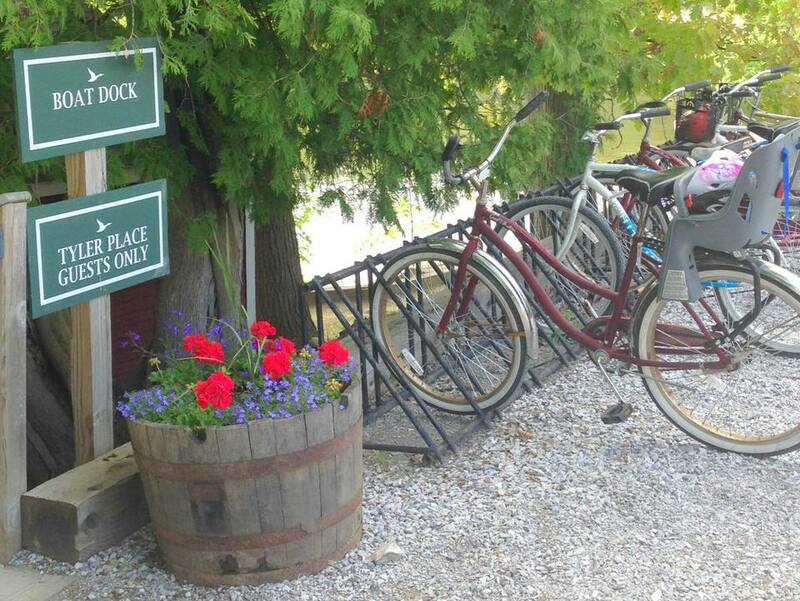 Getting around the Tyler Place's 165 acres on bikes brings a wonderful, old-school vibe to your vacation. Kids young and old pedal between their cottages and the inn, kids' group clubhouses, waterfront, pool and splash pad, archery range, and everywhere else. It's a great way to work off some of the delicious meals you enjoy all week long. More than any resort we can think of, the Tyler Place has infused biking into its fabric and culture. Teens and preteens go on guided mountain-bike trips with their counselors, and adults can choose between several guided bike trips, from an advanced mountain bike ride to a leisurely road loop. Some of the trips conveniently pass by swimming holes, allowing for a dip on hot days. And, again, use of mountain bikes on these trips is included in the price of your stay. Over the resort's 80-year history, hundreds of kids have experienced the joy of riding a two-wheeler for the first time at the Tyler Place, thanks to one-on-one private lessons (offered at a nominal fee), where counselors give youngsters the confidence and know-how to lose the training wheels. The only sad note? Giving your bike back at the end of a fantastic week of fun. With over 1,300 beautiful acres to explore, the Omni Amelia Island Plantation Resort on Amelia Island in the northeastern corner of Florida is a wonderland for biking families. At Amelia's Wheels, you can rent cruisers for adults and kids, Tag A Long bikes, and baby trailers. Seven miles of bicycle trails will take you under live oak canopies and over raised wooden bridges to some of Amelia Island Plantation's points of interest, such as Aury Island, Drummond Point Park and Walker's Landing. For a getaway on beautiful Hilton Head Island that's as relaxed or as active as you like, Palmetto Dunes Oceanfront Resort—with its world-class golf and tennis, beautiful beaches, and variety of on-site restaurants—is a solid choice. One of the best things about this sprawling resort is the flat bike paths leading everywhere. Families will love pedaling to the beach, restaurants, and little general store where they can pick up groceries, sundries, newspapers, penny candy and ice cream. You can rent bikes from Hilton Head Outfitters right on the property by the day, three days, or week. Kennebunkport may be best known for its beaches and its Bushes (the family of two US presidents has a large guarded compound there), but families will find much more to love about this darling seaside town in Maine. Named a top family-friendly town by Travel + Leisure, the gulf-side community of WaterColor on Florida's panhandle is easy to explore on two wheels, thanks to designated bike paths throughout the resort that lead to restaurants, six swimming pools, and boathouse for kayaking, paddleboarding, and canoeing. The Timpoochee Trail, an 18-mile bike path that connects the Emerald Coast's 16 distinct beach towns, runs right through WaterColor and provides flat, seamless access to local communities and their restaurants, art galleries, and other activities. Both adult and youth bikes are available to guests free of charge. When you book one of the resort's vacation homes, your bikes will be waiting just outside the front door when you arrive. Centrally located on world-famous Seven Mile Beach, Marriott's Grand Cayman Beach Resort is a beach-lovers paradise located within walking distance of the Cayman Islands' capital, Georgetown, with diving and snorkeling just offshore. The resort offers complimentary retro-style Linus Bikes to guests. As most of the island is relatively flat, decently paved, and properly signposted, Grand Cayman is one of the best Caribbean islands for biking. The best bike route is 10-mile West Bay Loop, a coastal bike trail where families can escape the crowds and discover secluded beaches and unspoiled mangrove wetland. Located on a barrier island off Georgia's coast, the historic Jekyll Island Club Hotel was once an exclusive members-only club for millionaires like Rockefeller and Astor. Today it's a family-friendly resort with many activities for kids and parents alike. You can explore the resort on wide bike paths lined with Spanish moss-covered oaks or venture further on the island's 20 miles of bike paths, including routes that zig through ​a lush maritime forest, zag through the National Landmark Historic District and wind along beachscapes. On magical Captiva Island off the coast of southwest Florida, South Seas Island Resort spans two and a half miles from Chadwick’s Square in the South Village to North Pointe at the northern tip of Captiva. Twenty miles of flat-as-a-pancake bike paths and sidewalks are a great way for you and your family to explore the resort. For the best deal, opt for the per-stay bike rental at check-in. Daily rentals turn out to be more expensive. Set on storybook Mackinac Island, where motorized vehicles are banned and folks get around on bikes and horse-drawn carriages, the 18-acre Mission Point Resort offers a myriad of ways for families to have fun, from flying kites or playing croquet on the resort's expansive front lawn to playing tennis or watching a movie in the old-fashioned movie theater. There's also a kid's program for children ages 5 to 12. Biking is the quintessential way to explore the resort and timeless island. Mission Point offers tandems, mountain bikes, cruisers, and speed bikes. In the foothills of New Mexico's Sandia Mountains, the family-friendly Hyatt Regency Tamaya Resort & Spa offers three pools, including a unique Kiva pool and a family pool with two-story waterslide; tennis; horseback riding; Camp Tamaya for the kids ages 3 to 12; and unique Srai Wi cultural activities. Families can take advantage of the resort's complimentary bike rentals to explore the Cottonwood Forest and Rio Grande River without leaving the grounds. Not far from Bend near the base of Central Oregon's Cascade Mountains, Sunriver Resort is a magnet for active families. The bike barn has over 400 bikes in the fleet ready to go, and each rental comes with a helmet, lock and trail map—the better to explore on the resort's 35 miles of paved bike paths and find the swimming pools, stables, marina, nature center, or observatory. Popular routes for families include the Benham Falls loop, a short eight-mile loop along the beautiful Deschutes River. At the Montauk Yacht Club Resort & Marina, located on the western tip of Long Island, New York, guests can take advantage of complimentary bicycle rentals and venture out to explore the historic fishing village of Montauk. There are unisex bikes, women's bikes, and kids' bikes available. The famed Montauk Lighthouse, located five miles away, makes for an ideal family biking destination. The family-friendly Ocean Edge Resort is the only property on Cape Cod to sit right on the historic 26-mile, car-free Cape Cod Bike & Rail Trail, a haven for cyclists and joggers. The resort offers four self-guided itineraries with suggested routes on the trail, which delights with sweeping views of the serene Cape Cod Bay, cranberry bogs, cute antique and chocolate shops along the way, and more. The luxurious Montage Palmetto Bluff, a Montage Resort in the heart of South Carolina’s Lowcountry, is the perfect setting for two-wheel fun. Bike miles of trails shaded by oak trees covered in Spanish Moss. Take advantage of the resort's complimentary beach bikes and you might spy wild boar, deer, armadillos and even bobcats scampering through the forest. Or, watch the sunset on the May River coastline as dolphins frolic and local shrimp boats haul in the day’s catch. California sunshine plus a bike-friendly beach town means your family will be itching to explore on two wheels. From the Hyatt Regency Newport Beach, you can take a leisurely ride to picturesque Balboa Island, Newport Beach Back Bay Ecological Reserve, or into the town of Newport Beach to enjoy the local eateries, beaches, and shops. You can also pedal the 10.5 mile Upper Newport Bay Trail, located just out the back door of the hotel. In northwest Ohio on the shores of Lake Erie, Maumee Bay State Park Lodge is one of the five affordable Ohio State Park Lodges. There are miles of paved bike trails inside Maumee Bay State Park, offering terrific bird and wildlife viewing. The trail system connects directly to the city of Oregon bike trails, which in turn connect to Pearson Metro Park trails. From May through October, bike rentals are available with infant seats available at no extra charge. Located in the Wild West town of Deadwood in South Dakota's Black Hills, the Deadwood Mountain Grand Resort, a Holiday Inn property, is just steps from the 109-mile George S. Mickelson Trail, where families can explore the surrounding spruce and ponderosa pine forests. Bikes are available on a complimentary first-come, first-served basis. One of Canada’s most luxurious and legendary hotels, the historic Algonquin Resort opened in 1889 and has wowed families with its indoor and outdoor pool, huge waterslide, playground, marshmallow roasts, and more. The Algonquin offers complimentary loaner bikes to guests for exploring the charming seaside town or making the 1.2-mile ride to 500-acre Minister's Island, which is oh-so-cool because it's only a part-time island. Due to the enormous tidal variances of Passamaquoddy Bay, you can ride across the sea floor to Minister's Island for several hours each day during low tide. On Florida's Panhandle, the enormous Sandestin Golf and Beach Resort community sprawls over 2,400 acres, straddling land between the Gulf of Mexico and Choctawhatchee Bay. Unlike a hotel, Sandestin Golf and Beach Resort offers a collection of 1,250 vacation rentals, including studios to four-bedroom condos, and vacation homes, giving families a wide array of options. Guests receive two complimentary four-hour bicycle rentals each day of their stay per unit. For families that like being active and outdoors but aren't into tent camping, El Capitan Canyon is a happy hybrid, known for delivering a glamping experience in its picturesque safari tents, upscale cedar cabins , and adventure yurts. Families can borrow the resort's complimentary bikes or bring their own and explore trails through the surrounding 300 undeveloped acres. The resort is only a five-minute ride from the beach, with views that make for an exceptional bike ride. In addition to biking, the Canyon offers a multitude of activities including guided hikes, yoga, rock climbing, and ropes courses.